We had a lot of fried potatoes when I was growing up. I like to think it was a Southern thing and no one made them like my Mom. 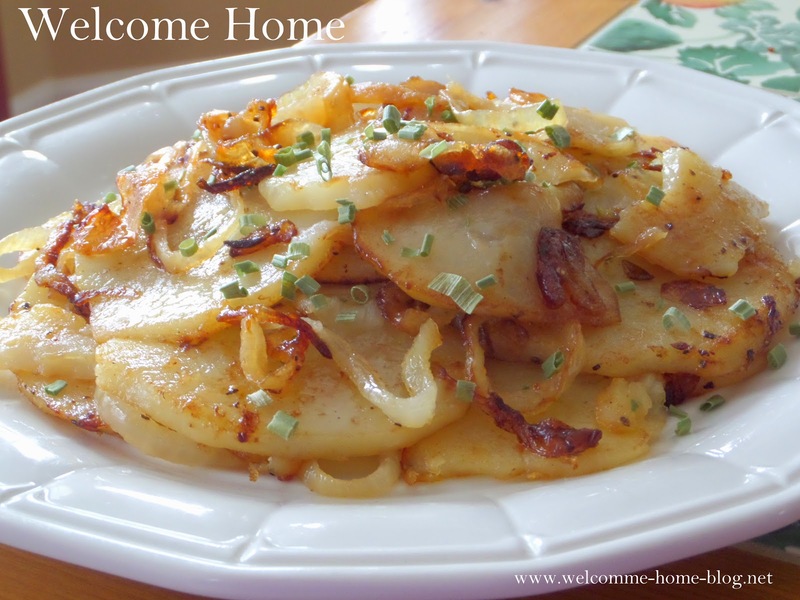 Oh sure, we loved her creamy mashed potatoes .... but fried potatoes and onions? Now that was a whole different story. Sometimes she would add some fresh green beans from her garden that she had cooked all day with ham hocks. Now that was a supper! And she always made fried potatoes with with soup beans and corn bread. When you think about it, you never see skillet fried potatoes on the menu of a restaurant. 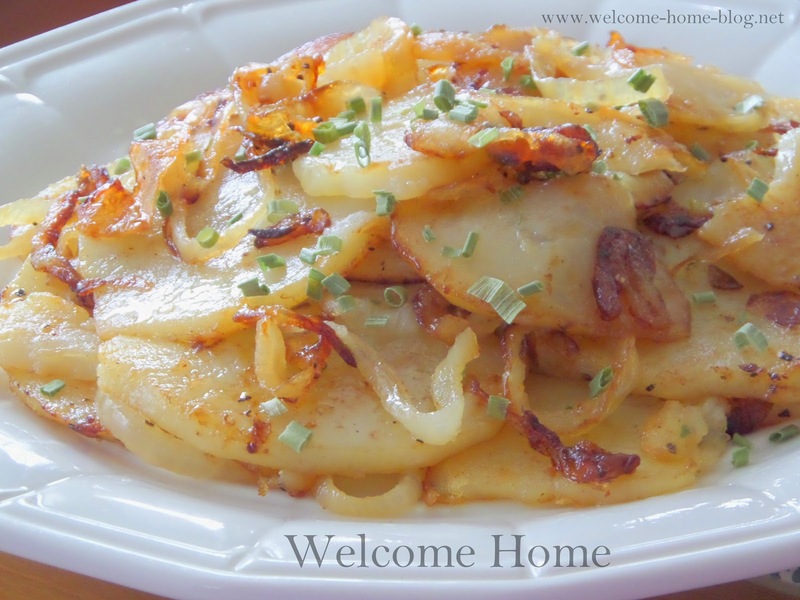 You might see home fries or hash browns but its hard to find good old country fried potatoes and onions. Looks like you'll have to make them yourself! Go ahead. This is what memories are made of. Slice the potatoes and onions. Melt the butter and the bacon fat over medium high heat in a large skillet (I use a 12 inch cast iron skillet). Fry onions until just tender and then add potatoes, spreading them in a single layer on the bottom of the skillet. Sprinkle on salt and pepper. Allow potatoes and onions to cook until golden brown on the first side and then flip and fry on the other side. Onions will start to caramelize so you want to scrap up the bits as you turn them. Turn down heat to medium and cover. Continue to fry, flipping a few more times until all the potatoes and onions are golden brown. Serve as a side dish with anything. Marty, whenever I fix beans and cornbread for dinner, it is served with fried potatoes. Pinto beans, fried potatoes, cole slaw and cornbread....great meal! This looks delicious. I don't put onions in mine but I am definitely gonna try this next time. My mother made this and called it "Potato Bargain." She started with bits of salt pork. I remember this so well from my childhood on Cape Cod. My husband made these for me over the weekend, it reminded me of being a kid when my dad made them in a cast iron skillet. Thanks for the memories! Love fried potatoes with onions.... Our favorite is sweet potatoes with onions but will never pass up white potatoes either! 1965, 3 months into my first pregnancy and nothing would stay on my stomach, I had lost 30 lbs. 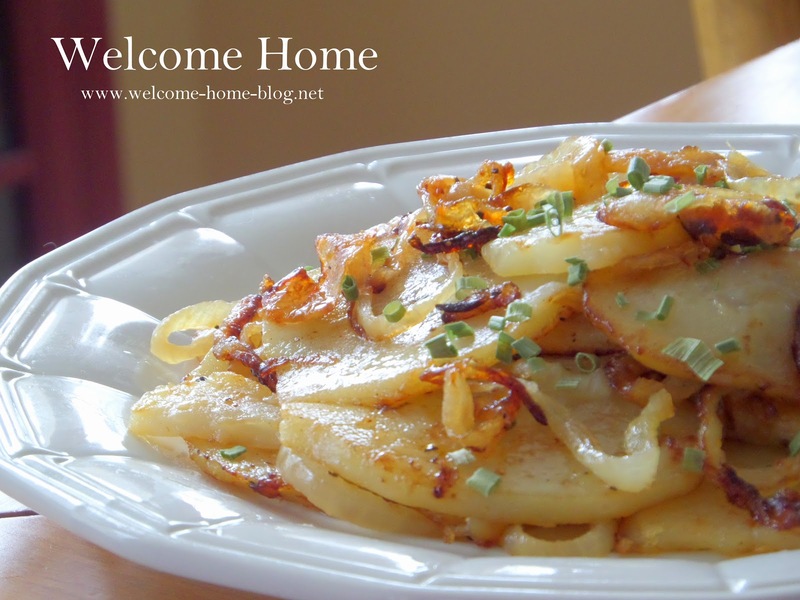 I woke up one morning craving what I had grown up eating, fried potatoes and onions. My husband said I would never keep them down but I did and it was the first thing that had stayed down the entire time. Still make them in the cast iron skillet, still have them every chance I get.